We woke up to a splendid late July morning. The girls are already playing outside, propelled by creative musings, as if they had stepped right out of magical night-time dreams into the sun. Before noon arrives, there will be large sheets of paper spread on the kitchen floor, with patches of color and stories unfolding every which way. The door is wide open and they run back and forth. They seem to soak inspiration right from the morning air, and rush in to put it on paper. Nature brings inspiration to the workbench as well. You already know about our huge collection of Vermont serpentine and the many pieces they have inspired. This gave us an idea. Let’s play a game. Spend some time gathering stones near or in the river. An ideal size would be one that fits cozily in the palm of a child’s hand. At least 5 stones per child is good. 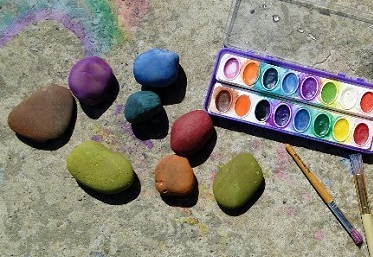 Have each child paint their stones. Plain colors, wild zigzags, animal and bug figures… anything goes, as long as they are made to stand out from ordinary stones. Allow the sun to dry the paint. Now, you will need to supervise a bit more for a moment. Send one child at a time to hide their stones around the property while the other children face a wall or go inside and sing a song. They can hide the stones at the base of trees, behind larger rocks, in flower beds and so on. When all stones are hidden, all children gather their baskets and start looking for and collecting as many painted stones as possible in 5 minutes. When they are done, they can play again and again and finally create a display in the garden with their colorful stones. Take a picture of it. Print it out and display it on the fridge. 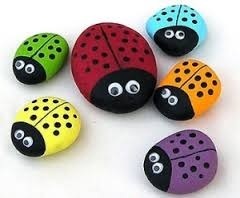 Bonus fun: Glue a magnet behind some favorite stones and use this to affix the summer fun photo to the fridge. Find more Little Hands Projects HERE.